Ron Watson leads product strategy and execution for Centric Software’s Centric 8 suite of PLM solutions for fashion and fast-moving consumer goods. He recently shared insights gained over the span of his 20-year career at Centric on what companies should look for in a PLM solution and the tech innovations that are transforming the industry. Q: What is PLM? Why is it used in the fashion industry? Ron Watson: PLM, or Product Lifecycle Management, evolved in the mid ‘90s as a key driver for managing the lifecycle of a product from initial design idea through the process of evolving it into a product, taking it to market and supporting it. It really came out of aerospace and automotive design – the key industries that drove the evolution of PLM. The team at Centric understands that background, but we were looking to develop in a new area – fashion. The apparel marketplace has lots of new products each year, and they are low cost in comparison to aerospace and automotive manufacturing. The fashion industry is characterized by very short production lifecycles, and the process of making clothing and footwear is complex. Businesses coordinate many moving parts under significant time pressures and deal with multiple suppliers, usually in different countries and time zones. Because margins are low, the potential for error at any stage is a major concern. Apparel companies require a very unique interaction with their suppliers and with the raw materials used to make products. The controls tend to be social. Are the components of the products being made in a safe way? Are the people producing the products being treated correctly? The apparel industry needs effective PLM solutions to handle these issues, deal with rapid change and enable efficient communication with suppliers, reducing the time necessary to create and ship a product. Q: That’s a good segue to my next question. What is different about PLM for fashion? Ron Watson: PLM for fashion is about managing every step of how clothing and footwear is made and retailed, from ideation to shelf life and beyond. It provides companies with an enterprise solution to achieve operational and strategic goals while bringing amazing products to market and controlling operating costs. Cost is key, and PLM for fashion involves understanding minimum order quantities, raw materials, and volume pricing. In terms of design and product development, a PLM solution for fashion should be capable of managing colors and materials and the relationship between the different materials on the product so the color matching is correct. For instance, the color green will look different on nylon versus cotton. Understanding the rules about how colors go together is important. All of these elements are decided in a short period of time. Producers try to bring new ideas to stores or e-commerce websites on shorter and shorter life cycles. Brands want to always have something fresh for customers, and they will often vary colors from one drop to another. Meanwhile, every product has to satisfy cost requirements and align with broader strategic decisions. PLM for fashion helps to coordinate all of these very different aspects of making apparel, from the technical to the financial. Merchandise Planning by Centric Software extends visibility from initial line plan proposal through sales commitments and recording of actuals. Brands can manage seasons, departments, collections and even specific styles to meet performance targets. Q: How does PLM handle the technical challenges of outdoor and sports apparel? Ron Watson: The materials in the outdoor industry are often very sophisticated and are “fit for purpose.” For example, we have a client that makes clothing for snowmobile users. They design the material on the front of the product to protect against the snow and cold wind but on the back the fabric is much lighter and more breathable. They needed to bring that material into a system that could manage that complexity while also managing the licensing required for a product like GORE-TEX. They found it with Centric. Q: Do you customize the software for them? Ron Watson: From the get-go, we thought about how to configure our PLM solution to meet our customers’ needs without having to customize the software. Configuration means keeping the same software but applying it to a specific need. If we customize a product for a specific customer, it locks them into a specific release and makes it difficult to migrate to a later release. Over the past two years, several fashion brands have left their highly customized PLM solutions and come to us because they have unfortunately become locked into a solution that has stalled and is not growing at the same pace as their business. Q: What challenges does PLM solve for the fashion industry? Ron Watson: This is a fast-moving industry. The primary challenges are speed, competition and the emergence of new brands. Product development is becoming highly digitalized, and companies are becoming more concerned about sustainability and CSR for the conscious consumer and the planet. In order to keep up with these rapid changes, businesses need digital solutions to efficiently track and manage products in development. PLM for fashion can help to speed time to market, enhance collaboration with internal teams and suppliers, control costs, trace where samples are (especially for luxury companies with high-cost samples), and enable efficient material usage. Companies need to understand what suppliers are producing to ensure that the suppliers do not order extra material and create knock-offs. The PLM system helps them manage that process much more closely. 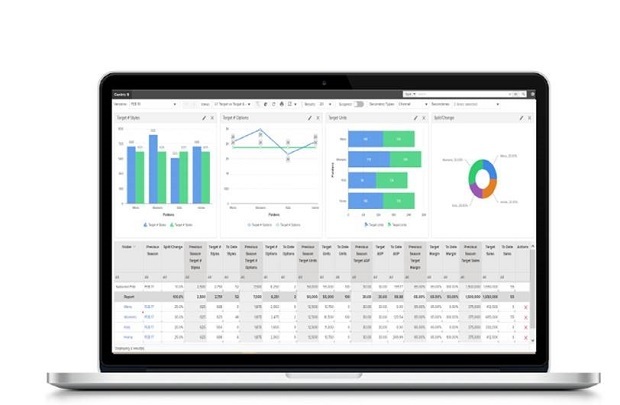 When companies use spreadsheets instead of a PLM, the spreadsheets easily get overwritten, duplicated or changed. Information gets lost, which results in errors and rework, adding back-end costs and delays. PLM’s centralized approach to product data ensures that everyone is on the same page. Q: What size of company adopts PLM? Ron Watson: All sizes. Centric’s clients range from fashion institute graduates and small companies with five or six people to multi-billion dollar companies that are producing thousands of styles each season. We support the whole spectrum of the apparel and consumer goods industries, from sports to footwear to haute couture. Q: What should a fashion and consumer goods company look for in PLM? Ron Watson: There are several things to consider. How innovative is the PLM vendor? Will they evolve with your business? You should look for a solution that is flexible enough to meet your company’s needs. SaaS can be more cost-effective than traditional software licensing – does the PLM vendor offer that option? Does the solution have mobile capabilities, so people can work from anywhere? Industry expertise is also an important consideration. Is the PLM vendor focused on your industry? Do they have references in the industry? Talk to them. Finally, look at the speed to deploy. Is the PLM solution something that can be configured to meet your needs in a short period of time? The culture of your company, and having the support of senior managers, is also a factor in the speed to deploy. At Centric, it can take as little as four to six weeks to install and implement our PLM at a smaller company. At the larger companies, it is four to six months. But it does depend on getting strong leadership for the project and buy-in from the organization. You want to work with a software partner who understands and is focused on your business. But you don’t want to do this for two years and then discover what they implemented is no longer how your business runs. The PLM needs to be flexible to adapt as your needs change. 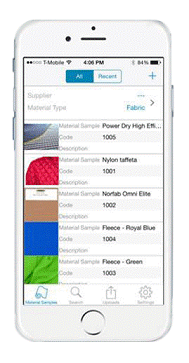 Material Sample App by Centric Software: Material developers use while traveling to collect material inspirations and to kick off the sampling process. Q: What upcoming technological innovations do you see in the apparel industry? Ron Watson: You never know what the next great thing in this space will be. New technologies come along and supplant things that we thought were cool two years ago. We see innovation as an important part of our business, and our team is constantly watching new developments. 3D printing has been transformational for the fashion industry. The initial samples are 3D, and that is fast becoming an expectation of apparel companies. There is new technology in development with haptics that allows you to get a sense of what the fabric may feel like, but we are not at a point yet where that is being used widely. Ultimately, the need to touch and feel the fabric is what prevents the elimination of physical samples altogether. The use of AI and machine learning to help guide decision making is also important. For example, AI can be used to find similar fabrics or buttons in a company’s portfolio, and present alternatives. AI can be used to design and even create certain products. All of those things are being looked at to produce new products more quickly. It can also help incorporate customer feedback and buying habits to drive new designs for future seasons. Made-to-measure, another trend in e-commerce and even in brick-and-mortar stores, allows the consumer to create their own designs in footwear and clothing. The customer creates his or her own design and in ten days they can get the product they designed. PLM is critical for this. It allows companies to eliminate waste and make the exact product the customer asked for. Q: What is Centric’s competitive edge? 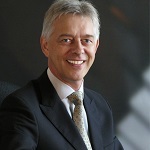 Ron Watson: Instead of sharing a PLM solution developed for cars and airplanes, at Centric we are purely focused on the fashion and fast-moving consumer goods industries – and this is for the past 12 years. At Centric, we develop our solution together with customers. Take Centric VIP (Visual Innovation Platform), our new digital touchboards solution, that was developed together with Fast Retailing. Or our latest release V6.5 with high volume sourcing capabilities, that was developed with our customer Big Lots. We listen to our customers, evolve our product to stay current with them, and even provide them with innovative new capabilities that help them move forward. I think that has always been our strength.